Ella was everything I was looking for in an instructor: it took me a long time searching for the right person to teach me and I'm glad I spent the time looking. The aspect of the driving school that caught my attention was the LDC's workbook and video clips. If you are like me and like to learn why you need to do certain things then I would highly recommend this driving school. Being able to watch the videos and have the pictures in the workbook helps you to see how to do something. I've always been a more academic person than practical and this experience has been the best for me. Ella was more than supportive with me. During my time learning I had my ups and downs and Ella consistently did everything she could to calm me down and give me confidence. After all, driving is a scary thing to do and you should feel comfortable right? Well if you feel a little nervous and you are afraid of an instructor getting annoyed with you, then I assure you this won't happen with Ella. 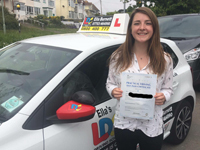 I think the key thing I want to tell anyone thinking of using Ella or the LDC driving school is that they don't just teach you to pass your test. If you do any research you will find countless comments saying that 'my instructor just taught me to pass my test' or even my friends said oh I learnt that after I passed by myself. Ella will teach you to be a SAFE driver and that is what everyone wants. Lastly, I want to thank Ella for everything she has done for me and I truly am going to be forever grateful for her help in gaining my freedom on the road. I really wanted a Driving Instructor who would work on specific things with me rather than just general driving skills. I knew some of the things I needed to work on and I needed to focus on those things to get better. I thought Ella’s teaching was really good and I found the videos of me driving really helpful because I could see what had happened in a particular situation in retrospect and see what I should have done. Ella’s help in manoeuvres was amazing! Just one session working on them made so much of an improvement. I liked that Ella taught me how to carry out the manoeuvre really slowly and constantly checking my mirrors to analyse whether I was where I wanted to be. I found this method particularly helpful because I can apply this system to any manoeuvre I do in a car, rather than relying on specific marking points. Telling Ella what I wanted to do or which lane I was going to move in to really worked for me because it allowed me to make my own decisions without being anxious of doing something dangerous. This allowed me to develop the confidence to make my own decisions at lanes and junctions. It was nice that Ella asked me if there was anything I wanted to do that lesson before we started because then we could work on things I felt less confident at. Learning to driver was harder than I expected. I will definitely recommend Ella to others because of all the things I have said above. Ella picked up on all the things that weren’t so good about my driving and then made sure we worked on them and I felt like I improved every lesson. Overall, Ella is a brilliant teacher and I feel like I improved so much in the 6 weeks we had. Thank you for working so hard with me and for teaching me. I’m still not perfect but I feel like I know how to continue to improve with all the help Ella has given me. 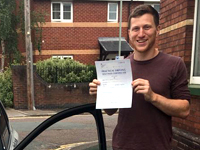 Ella was amazing at getting me ready in only a few weeks to take my test - I passed first time which was completely down with how Ella helped me! She never rushed me, and we worked together to find the best way in which she could help me. She goes out of her way to make sure each lesson can be the best it can be, whether it be spending her own time creating routes on the Satnav or changing her usual teaching method to accommodate my learning style. She genuinely cares about getting her students to feel relaxed and comfortable driving, which is a huge part of becoming a safe and competent driver. 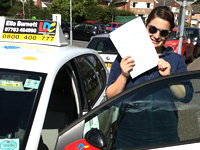 I could not recommend her highly enough, any learner driver would be lucky to have Ella as their instructor. Ella is such a good driving instructor, she always made everything clear and made sure I understood everything whilst also letting me be independent and not having to rely on her to make every decision. She always stayed calm and would help me if I made a mistake and would always do everything she could to solve the problem. I couldn’t have asked for a better teacher! Great instructor, friendly and very supportive. I couldn't of asked for a better driving instructor than Ella! I had a couple of different instructors in the past, but Ella with her professionalism, positivity and focus was beyond the comparison. I am a nervous person and I needed loads of support and patience, and Ella was the right person to provide all that. She could easily identify the areas of improvement and all weaknesses were practiced until they got mastered. She has a very calming attitude and was always letting me know that she believed in me, although sometimes I was loosing faith in myself. The LD system was very useful, from the video clips to the workbook. Thanks to the "mock test" session, I knew what I could expect from the test and surprisingly to myself, I stayed calm and in control during one of the most stressful events of people's life ( and passed 1st time!! ) I couldn't recommend Ella enough! 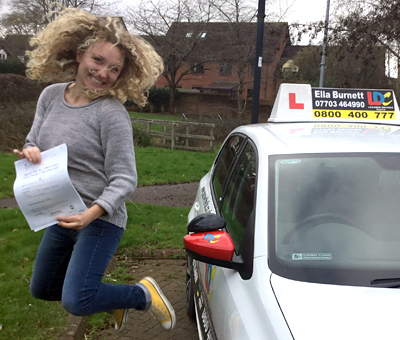 If you’re just starting learning to drive, or if you stopped because you lost hope - Ella is the one for you! She will get you through the test regardless to reservations you might have! I started learning in March 2017 and passed in October 2017, and it wouldn’t have been possible without Ella’s help and guidance. Along with the workbook and videos from LDC which prepared me for each lesson, Ella’s methods and approach to each lesson made it effective and relaxing to learn. 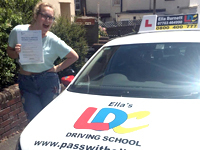 I would definitely recommend Ella as a driving instructor, simply from personal experience and can quite safely say that without her I wouldn’t have passed as the safe driver I am now! I needed a car with a manual handbrake and I prefer female instructors who have patience. Also, I had to fit my lessons around college, Panto and dance so I wasn't available very often and I needed someone who could accommodate my times. I thought that Ella was very thoughtful and patient with me when I couldn't do something. 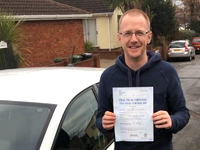 For instance, I like to have an order in which to do things so when I struggled to park, Ella gave me different methods with step by step instructions which helped me to feel more in control and comfortable when manoeuvring the car. 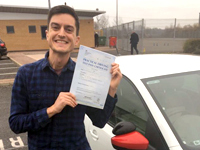 I found driving less stressful than I thought and I felt that I picked up the methods quicker than I had thought that I would which was reassuring and made me feel more confident. I would recommend Ella as she was supportive and helped me solve the issues that I struggled with slowly and she was happy to repeat things over and over to give me the chance to improve and feel comfortable. Ella is absolutely amazing, I could not recommend her highly enough. 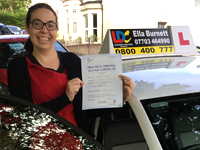 When I first came to Ella I was a nervous driver and Ella helped rebuild my confidence in Driving by taking it step by step, she did not rush me and asked me each lesson how I felt. 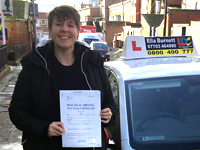 So if you need a driving instructor to help put you at ease and get you to your practical driving test I would recommend Ella. Thank you Ella for everything you did for me in order for me to get to where I am now that I have passed my driving test. I'm Emily from Exeter and I would highly recommend Ella as a driving instructor. She was patient, professional, made learning to drive enjoyable, and taught me how to drive safely. These were the qualities which I felt were essential when learning to drive, and what makes Ella a fab instructor. 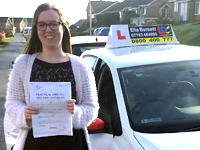 I felt really safe when I was in the car and she encouraged me towards independence and passing my test safely. At first I was quite nervous but quickly trusted that I was in control of the car and had Ella as backup. The lessons were well structured and It was evident she put a lot of time into planning my lessons as an individual. When I found difficulties she suggested trying different techniques to help me, such as with reverse parallel parking, she encouraged me to draw out and explain the manoeuvre step by step, as if I was showing someone else how to do it. 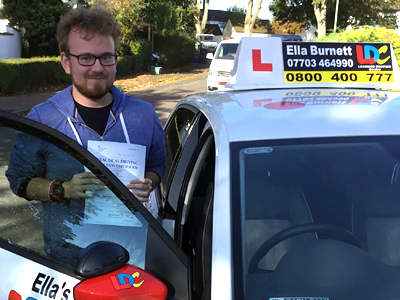 Having passed first time, I'm very happy with everything Ella has taught me and I'm glad I chose to learn with her! 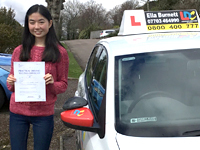 I passed last December (2016) with Ella, as an older learner driver the prospect of taking lessons again was quite daunting,however Ella's approach to learning settled my nerves very quickly and having a clear and structured lesson plan helped me immensely and gave me the confidence to finally get my licence, highly recommend Ella for anyone wanting to get on the road! 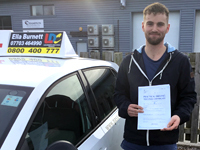 When choosing my driving school I was looking for somewhere that to my mind had a good track record giving me the confidence that I had a good chance of passing. I was also ideally looking for a female instructor as I'd had a fairly poor experience with a male instructor, albeit a long time ago, so was looking for a completely different approach this time around. The teaching methods used were very good. The pictures were useful to visualise what I was meant to be doing. Feedback from each session was also very useful as it acted as a reminder as to what we had done last session and what to focus on next time around. I was surprised how quick things happen when you're driving a car so the level of concentration required was higher than I had expected. This passed after a while but it was a bit mentally tiring for a while. Ella was very patient and the breaks we had helped in this respect so thanks! The flexibility Ella allowed in evening and weekend sessions really helped me out. Between work and other commitments it wouldn't have been possible to learn to drive with daytime sessions only. Ella was also very friendly so I enjoyed our sessions a lot. If I know of anyone who is looking to learn then I would definitely send them Ella's way. Ella was an absolutely fantastic driving instructor. She really helped me to feel at ease and was incredibly thorough when teaching me new things. She was very calm and patient and helped to talk me through situations when I was unsure. She would always take time to answer my questions and iron out any concerns I had. The lessons were really well structured and organised and Ella always worked around what I wanted to achieve which was brilliant. I would highly recommend Ella of LDC Driving School to anyone. Thank you for all of your help!